← Bowmore Celebrates Heart Health Feb 14 – Volunteers Needed! 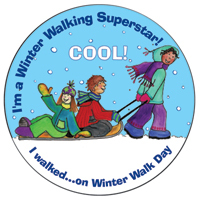 Wednesday, February 6, 2013 is Winter Walk Day across Canada. Having trouble walking to school as often as you’d like to? Well here’s a good idea! Pick Wednesdays as your walking day! We know it’s not easy to walk to school on these cold winter days, but make this day special and wear a crazy warm winter hat, gloves and boots and join us for a 10-minute workout in the schoolyard, put on by Career Fit Mom, before school begins!